Industry groups that tried to get Maryland to outlaw certain types of wood frame construction in big buildings are pointing to this week’s fire disaster in College Park as proof that concrete and steel is safer for large multi-level residential projects. 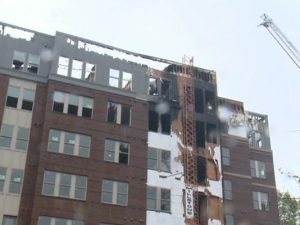 The 275-unit Fuse 47 building on Berwyn House Road suffered at least $39 million in damage and is still not safe for firefighters or engineers to enter because of damage to the wood-framed interior structure, according to Prince George’s County Assistant Fire Chief Alan Doubleday. “This could have been prevented,” said Joshua Baca of the Build with Strength Coalition, an industry group that unsuccessfully lobbied Maryland lawmakers to change building codes this year. Baca said concrete and steel is a better choice for multi-level projects because it is more fireproof. Currently building codes allow structures as high as five stories to be constructed using a wood frame, as long as they are protected by modern sprinkler systems. Fuse 47 included a three-story garage built with a concrete frame and five stories for residential living, which was built with a wood frame. The project was still under construction at the time of the fire, and the sprinkler system was not yet functioning.